I am feeling relieved these days knowing I have solved a big problem in our home. This post has taken nearly a year to write due to the various methods I have tried to find a solution to this issue. After several failed attempts at trying to fix this problem, I finally found a solution that meets all my requirements, which wasn’t an easy task. I equate the sound of chair legs rubbing against a tile floor to the sound of fingernails scratching against a blackboard, and the sound drives me nuts! I almost feel like my kids do it on purpose, constantly moving stools back and forth, rocking on the back legs and sliding them across the kitchen floor. FOR THE LOVE OF GOD….PLEASE STOP! I know they aren’t trying to upset me, but the sound makes me want to scream, or at least throw a chair across the room!!! Let’s be real…they are kids and aren’t going to stop anytime soon, so I needed a solution to this ongoing issue of mine. The problem is with the four stools surrounding our kitchen island that are constantly rubbing against our travertine floor. 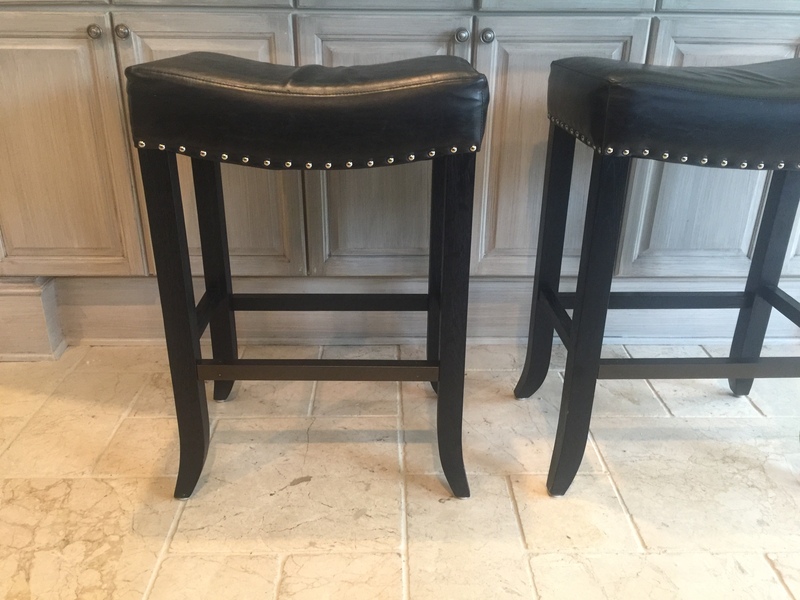 The stools, purchased from Arhaus, arrived with the typical plastic head nailed into the bottom of each leg. An additional challenge with these stools is that the legs are slightly curved on the bottom. How can we find a way to alleviate the scratching sound and also protect the natural stone floors? Let’s explore several options. Self adhesive peel off felt pads that easily attach to the legs was my first attempt. They lasted a few days and started slipping off each time the stool was moved. We have used this product (HERE) on many pieces of furniture around our house and they work great. They are a wonderful solution to protect hardwood floors from furniture that won’t be moved, such as sofa and table legs. They come in different sizes and shapes and are very affordable. But for chairs that have to be pulled out and pushed in, I do not recommend using these pads. Rubber leg protectors that stretch and have cork attached to the bottom. Again, not a good solution for chairs that will be constantly moved, but will work for furniture that stays in place. These rubber protectors stayed in place for about a day and then started to move around and eventually fell off. Personally I don’t find them attractive, think they look sloppy and aren’t a good overall solution. Therefore I am not recommending them. Stretchable cotton leg protectors found on ETSY that conform to your furniture and can be washed. OR should I call them dust collectors? Even though they appeared to be rather tight on the leg and form fitting, it only took a couple days before they started sliding off. As for the appearance, I personally don’t see the need to dress up my furniture legs with little socks, and these were the plainest ones I could find, attempting to blend in with the black wood. Due to all these reasons, I am not recommending them. Next attempt I tried rubber adhesive bumpers. Up until this point, I had left the plastic nail protectors that came with the stool, in tact. Let’s see if removing them will yield better results and open us up to more favorable solutions. I found the easiest way to remove the plastic caps was by using a screwdriver and hammer to get in between the seams. Then I removed the cap and nail with pliers. In some instance the cap did not stay attached to the nail head. In these instances I gently pulled out the nails with pliers. In a couple instances, I encountered sloppy workmanship. Bent screws were left inside the leg and hammered into the wood. These weren’t easy to remove, but I found using a screwdriver and hammer to jimmy the nail out worked ok.
Now that all the nail heads were removed, I cleaned the leg with a cloth to remove any build up of dust. I peeled off the backing and attached the rubber pieces to the legs. Appearance wasn’t too bad, but the within hours of the stool being moved a few times, the rubber had starting moving and came off completely. Another big failure. I think this product would work well for cabinet doors, but do not recommend using this product on the bottom of chairs or stools. My next attempt was to try nail on felt protectors (HERE). I have to be honest, I didn’t think these were going to function well. I thought the metal around the edges would bend when they were being hammered into the wood. Much to my surprise, they were very easy to install, did not bend and have stayed put! So far, it’s been over a month and I am very happy with this solution. All the protectors have stayed in place and are working well. The noise is gone, all the stools slide very easily and haven’t collected much dust. They come in different colors and aren’t very noticeable on the chair leg or stool. They are also available in a nail head (HERE) option. I definitely recommend this product. That’s it for now, see you next time! I may have missed the date on this post but I am just seeing it today and applaud your tenacity! Although I don’t have travertine floors, I too cringe at the sound of chairs and stools being dragged across the floor and am also concerned about damage that may be caused. I have to admit I literally laughed out loud at the photo and your comments about the ‘socks’ on the legs. This is the funniest thing I have seen in a long time. I may seem like a small issue, but the impact is significant and I can appreciate the time you spent on this solution. Maybe update the progress and repost every so often as a nice reminder and to see how they have held up over time. Hi Linda! So glad you came across the post! It is the little things in life that can drive us crazy or make us happy. And I was happy to find a solution to that annoying issue. We have moved those bar stools to our lower level and have new bar stools in our kitchen. The plastic glides that came with the new stools don’t seem to bother me as much as the previous ones but I’m sure it’s just a matter of time 🙂 Thanks so much for visiting!